TAKING images of living cells always presents the possibility that the act of observation will change the thing being observed. Clusters of cells inside an organism scatter light, making images fuzzy and indistinct. The typical solution is to increase light levels way above what might be experienced in nature, but this presents the risk that what is being observed is not truly natural behaviour. Now physicist and 2014 Nobel prize winner Eric Betzig, at the Howard Hughes Medical Institute’s Janelia Research Campus in the USA, has developed a technique combining two imaging technologies to observe and record action in sharp detail, in 3D, inside living cells. One is adaptive optics, a technique used in astronomy to compensate for the turbulence of the atmosphere. The second is lattice light sheet microscopy, in which an ultra-thin sheet of light is swept through the cell to acquire a series of 2D images which can be assembled into a 3D high-resolution movie. 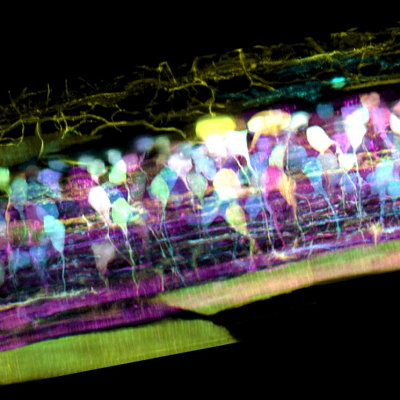 The in-vivo action captured has included detail as cancer cells crawl, spinal nerve circuits wire up, and immune cells cruise through a zebrafish’s inner ear. Betzig and colleagues reported on the work in the journal Science. The sharpest views of living cells (in-vivo imaging) have traditionally come from cells isolated on glass slides, but large groups of cells inside organisms scramble light, Betzig says. “This raises the doubt that we are not seeing cells in their native state, happily ensconced in the organism in which they evolved”. Even when viewing cells individually, microscopes are usually too slow to follow the action in 3D. They bathe cells with light thousands to millions of times more intense than the desert sun, Betzig says, and “this contributes to our fear that we are not seeing cells in their natural, unstressed form. The new instrument combines an adaptive optical system to maintain the thin illumination of a lattice light sheet as it penetrates within an organism, and another adaptive optical system to create distortion-free images when looking down on the illuminated plane from above. The distortions in the image of this ‘guide star’ tell the team the nature of the optical aberrations along either pathway. In one movie from the microscope, an orange immune cell wriggles through a zebrafish’s ear while scooping up blue sugar particles along the way. In another, a cancer cell trails sticky appendages as it rolls through a blood vessel trying to attach to the vessel wall. The complexity of the 3D multicellular environment can be overwhelming, Betzig says, but the clarity of the new imaging system permits them to computationally ‘explode’ individual cells to focus on the dynamics within. This detail is hard to see without adaptive optics, because “it’s just too damn fuzzy”. Betzig believes that adaptive optics is one of the most important developments in microscopy today, and lattice light sheet microscope is the ideal platform to showcase its power. Adaptive optics hasn’t taken off before, he says, because the technology has been complicated and expensive. Indeed, his current instrument occupies a 3m-long table. “It’s a bit of a Frankenstein’s monster right now,” he admits. But his team is working on a new version that should fit on a small desk, at a cost within the reach of individual labs. They will also freely publish plans to allow others to create their own versions. Ultimately, Betzig hopes that the adaptive optical version of the lattice microscope will be commercialized, as was the base lattice instrument before it.